When Should I Buy a Semi-Inground Pool Instead of an Inground or Above Ground Pool? When it comes to adding a swimming pool to your backyard, there are a surprising number of options. The way you build your pool should always be determined by your own personal preferences and those of your family. How you want to enjoy your pool is the most important deciding factor. After all, it's your relaxing retreat and it ought to be built to help you relax in the best way possible. However, sometimes the land makes decisions for us. 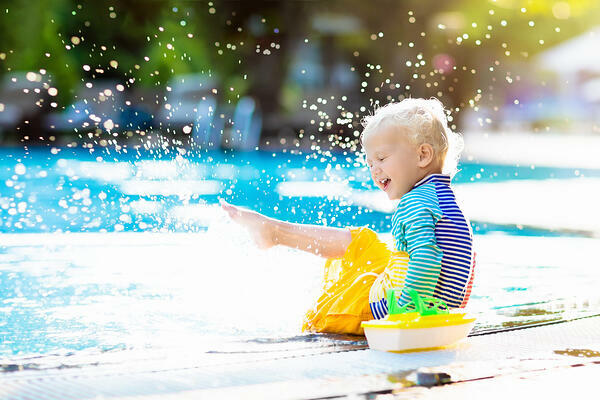 Because a pool is such a large addition to your yard, certain aspects of your backyard are going to determine what kind of pool you can install. Who Should Have a Semi-Inground Pool? So what are the right circumstances for a semi-inground pool? Have you seen these half-in, half-out pools and fallen in love with the dynamic design of pool wall and sunken pool depths? Or are desperately longing for a backyard retreat but your yard is making the design seem difficult if not impossible? These are the two types of buyers that we typically see looking towards semi-inground pools. The fact of the matter is that almost anyone -can- have a semi-inground pool. All you need to do is dig down about half the amount of depth you would need for a fully inground pool, then build the sides of your pool up to the proper height. 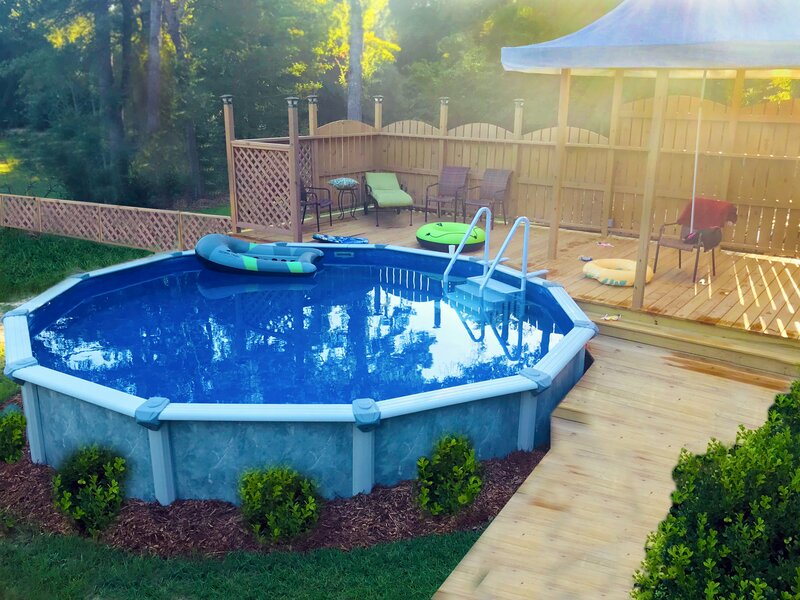 Semi-inground pools can also be more decorative than inground pools because you have a protruding side of the pool that can be built into your yard. That being said, some yards are therefore better suited for semi-inground pools than others. 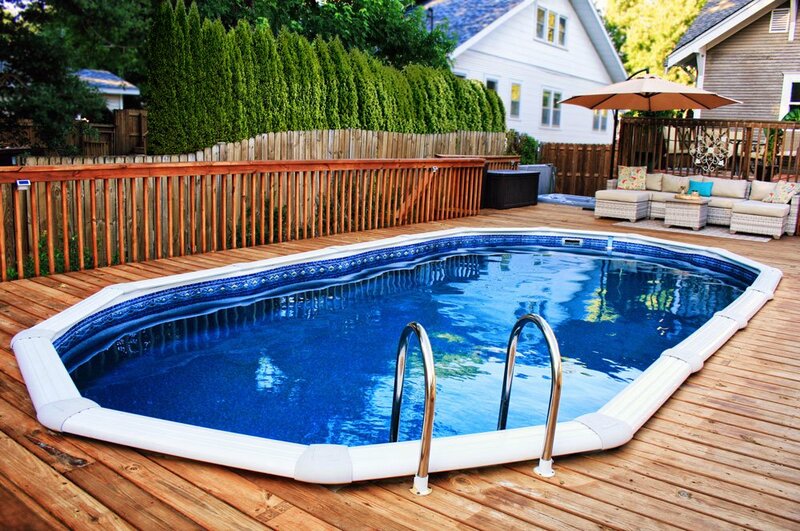 In these specific circumstances, a semi-inground pool is actually your best pool option. Let's take a closer look. Everything from the soil composition to the size and shape of your yard can determine the right kind of pool for you to build. How easy it is to dig, how much it rains, and how much room you have to build. Large yards, naturally, can support a wider pool, but even small yards can be used to create deep, beautiful pools. And sometimes, a multi-layered design is necessary for your yard. No matter what kind of yard you have, the natural elements will influence how you build your pool. 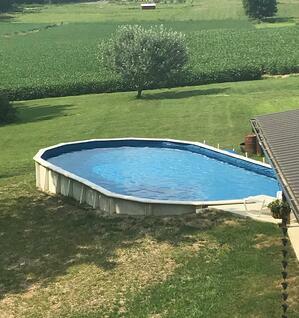 By far the best situation for a semi-inground pool is when your yard has a notable grade. For anyone who lives on a hill or slope, installing a traditional inground pool may be impossible. 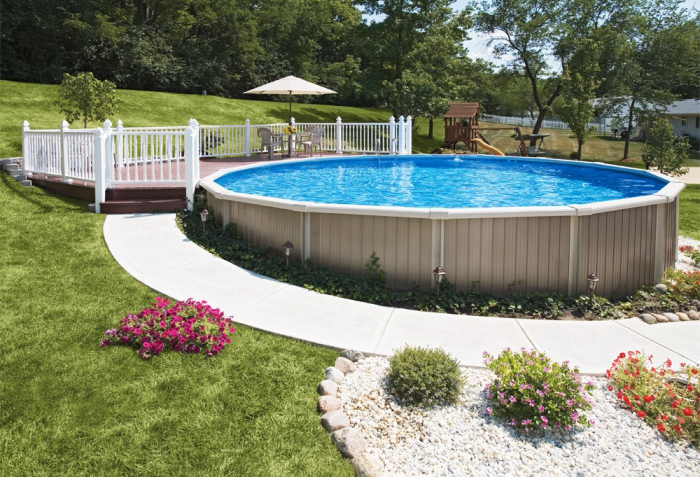 This is because to build an inground pool, you need your yard to be completely flat. This way the top of the pool can be even and flush with the ground preventing debris and surrounding soil from filling your pool after it rains. So what's to be done for the many backyards that are part of a steep hill as a natural part of the local terrain. Are the doomed to be forever pool-less? Not anymore! Fortunately, having a sloped yard doesn't mean you have to forgo the joys of having a pool. With the semi-inground design, you don't have to worry about raising the low side of your yard or leveling a natural hill. Instead, reinforced walls will stand artistically out of the low side of the yard while meeting your raised deck at a convenient level. Another interesting challenge for pool installation is digging out the pool's hole. With an inground pool, your pool can only be as large as the hole you dig. This can make a full-sized pool difficult when the ground under your home is rocky or otherwise challenging to dig through. You may have layers of rock below the surface or just a large percentage of big rocks that will make digging more time-consuming and expensive. People with wide, soft-earth yards have the easiest time putting in a fully in-ground pool. While homeowners with very rocky soil or layers or rock sitting below the surface often opt for an above-ground pool rather than blasting their way into the ground. A semi-inground pool doesn't have to go as deep into the terrain as traditional inground pools. Breaking ground is different for every property, and some are much easier to dig into than others. If you're meeting a lot of resistance digging into your backyard, a semi-inground pool could be your ticket to a quicker and more affordable swimming hole. Some homes, especially in older cities, don't own the entire depth of ground below their houses. The city has infrastructure -- cables, pipes, and even tunnels -- that might limit the possible depth of your pool. But that doesn't mean you have to resort to a fully above-ground pool. Instead, you can calculate exactly how deep your pool can safely be for you to dig and create a semi-inground pool that will be just as satisfying. Especially with a beautiful surrounding deck! This is a great way to use the depth you have for a much more dynamic yard design than a typical above-ground pool can offer you. No matter what kind of landscape you're starting with, the best thing about a semi-inground pool is the opportunity to create a multi-level design. Semi-inground pools are great for designs that include a high deck and a low yard, a seating area around the side of the pool, and work beautifully when combined with a tiered hot tub. There are many ways to design a beautiful space with a semi-inground pool using the natural shape and features of your land. You don't have to shape your backyard to the needs of a pool. 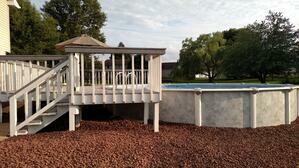 A semi-inground pool can conform to your yard or even an existing multi-level design. If you have a steep, rocky, or already dynamically designed backyard, then a semi-inground pool could be the perfect addition to your outdoor oasis. For more information about what is involved with installing a semi-inground pool or a consultation to decide if semi-inground is right for you, contact us today! 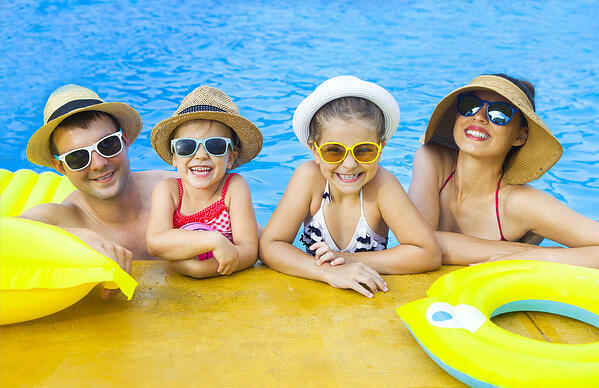 Our team here at Royal Swimming Pools is always happy to help design the perfect pool for your family!